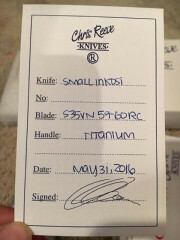 Discussion in 'Chris Reeve Knives' started by Wavicle, Mar 20, 2016. Two of the eighteen cards I have use the term "CUTLER" under the Chris Reeve name at the top of the card. The remaining sixteen use the term "KNIVES" as shown below. Has anyone else noticed this? It's odd because I thought maybe they were changing the name but the dates make no sense as there is a mix over time. My guess is older cards vs newer cards. I don't think the birth date is necessarily related to the time the card was printed. The Mnandi and 25 being the older cards. Side note, the whiteout bugs me. I'm thinking of asking to have correct cards sent to me. Not sure yet. The cutler one has a different signature? Mine says cutler on one side and knife on the other. January 2016 made. While I did not notice until today, I can add to the riddle. I've got a card that says Knives on the front and Cutler on the back. Do we have a code here? I wondered about this and can help as I recently got down to the bottom of this and received an official reply. I know that you cannot authenticate knives via email, but can you please confirm that this birth card is a format that you use? The signature looks different from older ones too, but I think that changed last year. Thanks heaps, and keep rocking away!! 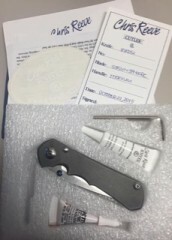 Congratulations on your new Small Inkosi! That is the correct birth card. We introduced the Inkosi after we had introduced the printed birth cards and we did not have any birth cards printed with Inkosi so we have been using blank birth cards. We didn't get new cards printed because we are introducing new packaging and birth cards and we decided to use up as much existing stock as we could. We hope that you enjoy your Small Inkosi and that it serves you well. Sounds like there will be new cards AND boxes very soon! OK, but does anyone know what CUTLER means? A cutler is a maker of cutlery. My last name is Cutler and I never did anything with a knife but cut stuff, mostly myself. I do think it’s neat when the card has my name on it. I tell my wife it’s a sign that I should buy it. Wavicle, Lone_Wolfe and HarryD like this. possible some ancestor was a cutler-you got the name for free, but the interest in blades lives on. Many last names were derived from someone's profession. Your job used to be your family name. Cooper, Baker, Smith, Cutler, all trades. If you ever want to make knives you've got a leg up! Cutler: A person who makes, sells, or repairs knives and other cutting instruments. What is everyone’s opinion about the signature on the cards when Chris left the company years ago? Printed signatures have always bugged me a little, because it is against the entire concept of one’s signature. However, when that person doesn’t even work at the place, it seems like a double-whammy. I think it would be classier to eliminate it. Just my opinion. Doesn't bother me, but it may be time to move to Tim's signature. He likely will be running it for some time. I’m with kidcongo on this- eliminating the signature may be a better approach at this point. I agree with removing the signature. 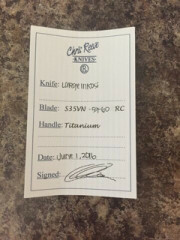 Since the knives are not all inspected and signed by hand just go with an informational card.